Many people need additional sources of income. This need becomes acute as people enter retirement. Precisely where people have the greatest need is also when they are most vulnerable to misunderstanding. Making mistakes with income risks lowering your future standard of living. 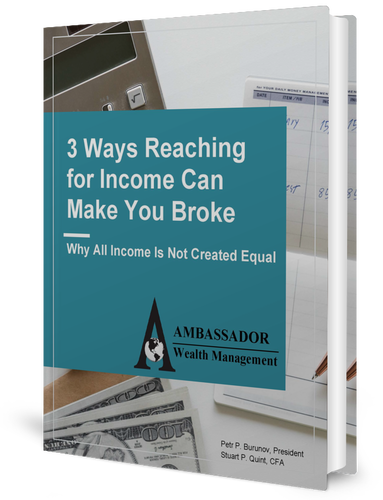 We continuously run into clients who seek income, but who have misunderstood what they will actually receive. Oftentimes, we find people who mistake yield for total return (and forget that they need to earn at least their principal back with some positive return). In other situations, investors fail to consider taxes into their overall equation. Sometimes, people lock up their money in hopes of a greater coupon. Yet, they leave a lot of money on the table because they fail to understand the intricacies of illiquid investments. One of the greatest pitfalls we see is people who buy into the promise of durable, high-income payment. Because they forget about risk, the investment might not live up to its promise. Thus, investors suffer losses, including reduced income.